On 29 July the Iceland Met Office (IMO) reported that a glacial outburst flood (jökulhlaup) in the Múlakvísl river, SE of Katla, had begun, and a M 3 earthquake along with a few smaller earthquakes were located in the N part of the caldera. Nearby seismic stations detected tremor possibly linked to the flood, though a subglacial volcanic component was not ruled out. The Aviation Color Code was raised to Yellow, the second highest level on a four-color scale. The public was advised to stay away from the river; it was dark colored and had a sulfur odor. By 31 July the jökulhlaup had subsided with conductivity measurements and tremor slowly reaching normal levels. The Aviation Color Code was lowered to Green. Microseismicity preceded and accompanied a jökulhlaup (a glacier-outburst flood) on 9 July 2011, as reported by the Iceland Met Office (IMO). The jökulhlaup escaped from under Mýrdalsjökull, the glacier that rests above Iceland's Katla volcano, its 10 x 14 km caldera, and environs (figure 4). IMO reported that microseismicity was registered near several ice cauldrons in the caldera for a few weeks prior to the event (figure 5). Peak harmonic tremor on 8 July coincided with rising water levels and increased water conductivity, as measured by the main flood gauge (figure 6; gauge is at red triangle on figure 4). Figure 4. A map of road closures and restricted areas of Mýrdalsjökull glacier resulting from the 9 July 2011 jökulhlaup at Katla (see key, lower left). The town of Vík is shown near the bottom (in black), and the main road through the area is shown in red; the trace of Katla caldera is shown in black and labeled. The main flood gauge was on the bridge across the Múlakvísl river; both were destroyed in the jökulhlaup event (red triangle). Inset shows the geographic location of Katla and Mýrdalsjökull in the S of Iceland. Restricted areas map modified from ágúst Gunnar Gylfason of the National Commissioner of the Icelandic Police-Department of Civil Protection and Emergency Management; index map modified from Ginkgo Maps. Figure 5. Map (top) and plot (bottom) of the seismicity recorded during 8-9 July 2011 at Katla. Colors indicate the timing of epicenters and their respective plotted magnitudes, recorded as late as 2250 on 9 July 2011, according to the scheme shown below the map. Black triangles indicate seismic monitoring stations. Courtesy of Iceland Met Office (IMO). Figure 6. Running plots of (a) water level, (b) water temperature, and (c) water conductivity at the main flood gauge of the Múlakvísl river during 3-9 July 2011. The plots show rising water level and conductivity that were coincident with peak harmonic tremor. The plots stop abruptly (red vertical line) when the gauge was destroyed along with the bridge crossing the Múlakvísl river. Courtesy of Iceland Met Office (IMO). IMO reported that, on the same day, the main flood gauge was damaged when flood waters reached the instrument near midnight; another station, normally not in the water, started recording rising water around 0400 on 9 July, and the water level there rose 5 m within 5 minutes (figure 7). When the flood reached the main road approximately one hour later, the main bridge over the Múlakvísl river was destroyed and the road was closed (red triangle, figure 41). Figure 7. A running plot of water level at the second flood gauge (normally not submerged). The plot shows a significant rise in water level (5 m within 5 minutes). Courtesy of Iceland Met Office (IMO). According to the news source Morgunblaðið, 200 people were safely evacuated, and allowed to return to their homes by that afternoon. Morgunblaðið reported that analysis of the flood waters indicated that the flood was caused by geothermal water, but that a sub-glacial eruption at Katla could not be ruled out. IMO stated that the harmonic tremor declined on 9 July, following the jökulhlaup event. After observational flights, new cracks and cauldrons were reported in the ice of Mýrdalsjökull glacier (figure 8). Figure 8. Cracking and subsidence of the Mýrdalsjökull glacier around an ice cauldron above the Katla caldera. Widespread gray tephra deposited on the ice surface is due to the 2010 Eyjafjallajökull eruption (BGVN 35:03, 35:04). Courtesy of the Icelandic Coast Guard. By 16 July, the National Commissioner of Icelandic Police in the Department of Civil Protection and Emergency Management reported that a new bridge had been built to replace the bridge destroyed in the jökulhlaup (figure 9). Figure 9. Photograph of the remains of the bridge crossing of the Múlakvísl river, destroyed in the jökulhlaup event on 9 July 2011. The new bridge, constructed by the 16 July 2011, can be seen in the background. Courtesy of John A. Stevenson. August-December seismicity. IMO reported increased seismicity under Mýrdalsjökull in October (figure 10). They reported that 512 earthquakes occurred, with ~ 380 originating within the Katla caldera; a large portion (nearly 100) of those 512 earthquakes occurred on one day near the beginning of October (figure 11). The largest reported earthquake was M 4, with seven being larger than M 3. On 8 November, an M 3.2 earthquake that originated in the S most part of the caldera was felt by residents in the town of Vík. Overall, following the July 2011 jökulhlaup event, seismicity has increased above background levels of the past year. The seismic peak is noticeable with respect to the number of earthquakes, their largest magnitudes, and the clustering under Katla (figures 10 and 11). The largest earthquakes were as large, or slightly larger, than the other earthquakes of M 3 or greater in earlier episodes of unrest (i.e., 1999 and 2002-2004, figure 10). The bulk of the 2011 seismic increase occurred over a shallow depth range (within 4 km of the surface, figure 12). Figure 10. Plots of seismicity (greater than M 0.6) at Katla since 1999, showing the October 2011 seismicity in comparison with past episodes of non-eruptive unrest, such as in 1999 (sub-glacial eruption is uncertain in the GVP database) and 2002-2004. Plots (from the top) show: the monthly number of earthquakes (log scale); the magnitudes of earthquakes; cumulative number of earthquakes (red) and cumulative seismic moment (blue); and the focal depths of the located earthquakes. Courtesy of Iceland Met Office (IMO). Figure 11. Seismic events (stronger than M 0.5) per day at Katla during December 2010-December 2011. Raw data is shown in blue, the 5 day moving average is shown in red, and events stronger than M 3.0 are indicated by gold stars. These trends highlight the increased seismicity of August-December 2011. Courtesy of the University of Edinburgh School of Geosciences. Figure 12. Cumulative number of seismic events (stronger than M 0.5) at Katla since 23 November 2010. All events are shown in yellow, and events originating at depths greater than 4 and 10 km are shown in orange and red, respectively. During the August-December 2011 increase in seismicity, the majority of the recorded events originated from shallow depths (less than 4 km). Courtesy of the University of Edinburgh School of Geosciences. Television filming sparks eruption fears. The Iceland Review reported that, in the early morning of 9 December, the Icelandic emergency hotline received calls from residents reporting bright lights on the slopes of Mýrdalsjökull. Callers feared that an eruption had started at Katla. The bright lights had also been noticed on a webcam by observers in Norway, who also enquired if there was an eruption. When the glacial slopes were inspected to find the cause of the lights, it was discovered that they were from film crews for the HBO series "Game of Thrones", who were filming in the early morning to capture the desired light conditions. Information Contacts: Einar Kjartansson, Iceland Met Office (IMO), Bústaðavegi 9, 150 Reykjavík, Iceland (URL: http://en.vedur.is/); National Commissioner of the Icelandic Police-Department of Civil Protection and Emergency Management, Skúlagata 21, 101 Reykjavík, Iceland (URL: http://www.almannavarnir.is/); Ginkgo Maps (URL: http://ginkgomaps.com/); Morgunblaðið, Hádegismóum 2, 110 Reykjavík, Iceland (URL: http://mbl.is/); Icelandic Coast Guard, Skógarhlíð 14, 105 Reykjavík, Iceland (URL: http://www.lhg.is/); John A. Stevenson (URL: http://all-geo.org/volcan01010/); The University of Edinburgh School of Geosciences (URL: http://www.ed.ac.uk/schools-departments/geosciences); The Iceland Review, Borgartúni 23, 105 Reykjavík, Iceland (URL: http://www.icelandreview.com/). The Iceland Met Office (IMO) reported that an intense seismic swarm began at Katla on 29 September. The activity intensified again at 1202 on 30 September with tremor and several earthquakes M 3 or larger. The Aviation Color Code was raised to Yellow, the second highest level on a four-color scale. On 3 October IMO stated that the seismic swarm was the largest one in decades, though it appeared to be over. According to a news article from 3 October popular travel destinations near the glacier had been and remained closed to traffic. The Iceland Met Office (IMO) reported that seismic activity within Katla's caldera had increased in mid-June and then began to decline. On 29 August two earthquakes of about M 4.5 occurred in the NE part of the caldera, the largest earthquakes detected at Katla since 1977. The ensuing swarm that same day produced over 100 earthquakes, the largest of which was M 3.3. Seismicity was low after the swarm had ended. Throughout the summer, electrical conductivity levels in the Múlakvísl River, which drains from the E side of the Mýrdalsjökull glacier that covers Katla, had remained unusually high, reflecting a constant source of geothermal meltwater. There had also been frequent reports of a sulfur odor close to Múlakvísl; gas measurements near the source of Múlakvísl revealed unhealthy levels of hydrogen sulfide, also indicating high concentrations of geothermal fluids. IMO noted that the recent earthquake activity does not appear to have significantly affected conductivity levels in Múlakvísl. IMO stated that summertime increases in caldera seismicity are an almost annual occurrence at Katla, often associated with the drainage of geothermal meltwater causing minor floods in glacial rivers from Mýrdalsjökull. The Iceland Met Office and news sources reported that on 9 July a jökulhlaup from Myrdalsjökull, the ice sheet that covers Katla, originated from three ice cauldrons in the SE part of the caldera. During previous weeks microseismicity had been registered near several of the ice cauldrons. Around the time of peak harmonic tremor, in the early evening on 8 July, the Myrdalsjökull flood monitoring system indicated increased conduction. The water level reached the bridge around midnight and damaged the sensors. According to news articles, one new cauldron that had formed, along with cracks in the glacier around the cauldrons, may have been caused by a small eruption at Katla although no evidence of an eruption was observed. The jökulhlaup had destroyed a 128-m-long bridge and caused damage, resulting in the closing of part of the Ring Road. About 200 people were evacuated from the area but allowed to return home later that day. On 10 July the water had subsided and returned to normal levels. Figure 1 shows annual seismic strain release from 1970-September 1977 in the Myrdalsjökull area. After 1977, the annual strain release was similar to that of 1970-74. Figure 1. Annual seismic strain release in the Myrdalsjökull area, February 1970 through September 1977. From Skjálftabref (published by the Icelandic Meteorological Office, no. 26, October 1977. Courtesy of Ragnar Stefánsson. Information Contacts: R. Stefánsson, Icelandic Meteorological Office. 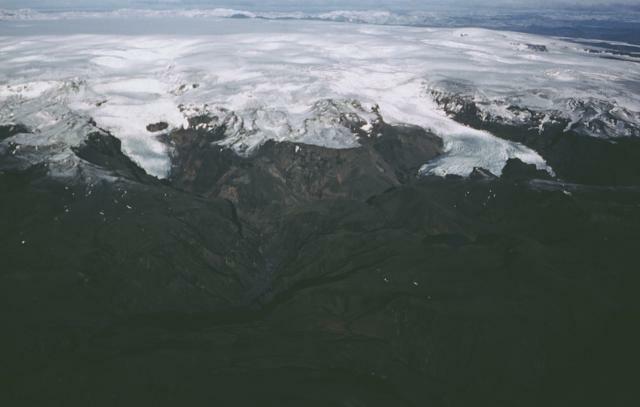 In the early morning of 18 July, a small jökulhlaup (sudden glacier-outburst flood) lasting less than 24 hours, occurred in "Jökulsá á Sólheimasandi," one of the rivers draining from the Mýrdalsjökull icecap (figure 2) towards the S. Inspection of the icecap revealed that a new ice cauldron, ~2 km wide, and 50 m deep, had formed just above the origin of the Sólheimajökull outlet glacier. The jökulhlaup was preceded on 17 July by a 20-minute-long burst of modest volcanic tremor (reported by P. Einarsson). Intrusion of magma at a low level within the subglacial Katla volcano or even a small subglacial eruption may have occurred, possibly associated with pulse of CO2 which could have caused boiling in geothermal areas under the icecap. Figure 2. Topographic map of the Mýrdalsjökull icecap over Katla volcano showing tilt stations. Courtesy of the Nordisk Vulkvanologisk Institut. From 18 July until mid-August, ten new ice cauldrons formed along the W, S, and E borders of the Mýrdalsjökull caldera (figure 3), signifying increased geothermal activity along a large part of the caldera rim. Changes on the icecap surface have been reported for some of the earlier eruptions of Katla, and the current activity could be a possible long-term precursor to a new eruption. A flight over the area on 9 September by Reynir Ragnarsson at Vík, revealed that the ice cauldrons did not develop much after mid-August. Figure 3. One of the new ice cauldrons on Mýrdalsjökull, July-August 1999. Photo by Freysteinn Sigmundsson. Information Contacts: Rósa Ólafsdóttir, Guðrún Sverrisdóttir, Freysteinn Sigmundsson, Erik Sturkell, and Níels Óskarsson, Nordisk Vulkvanologisk Institut, Grenásvegur 50, 108 Reyjavík, Iceland (URL: http://nordvulk.hi.is); Helgi Björnsson, Páll Einarsson, and Magnús Tumi Guðmundsson, Science Institute, University of Iceland, Dunhaga 3, 107 Reykjavík, Iceland (URL: http://www.raunvis.hi.is/); Ármann Höskuldsson, South Iceland Institute of Natural History, Strandvegur 50, 900 Vestmannaeyjar, Iceland (URL: https://www.nattsud.is/). Katla volcano, located near the southern end of Iceland's eastern volcanic zone, is hidden beneath the Myrdalsjökull icecap. The subglacial basaltic-to-rhyolitic volcano is one of Iceland's most active and is a frequent producer of damaging jökulhlaups, or glacier-outburst floods. A large 10 x 14 km subglacial caldera with a long axis in a NW-SE direction is up to 750 m deep. Its high point reaches 1380 m, and three major outlet glaciers have breached its rim. Although most historical eruptions have taken place from fissures inside the caldera, the Eldgjá fissure system, which extends about 60 km to the NE from the current ice margin towards Grímsvötn volcano, has been the source of major Holocene eruptions. An eruption from the Eldgjá fissure system about 934 CE produced a voluminous lava flow of about 18 km3, one of the world's largest known Holocene lava flows. Katla has been the source of frequent subglacial basaltic explosive eruptions that have been among the largest tephra-producers in Iceland during historical time and has also produced numerous dacitic explosive eruptions during the Holocene. This volcano is located within the Katla, a UNESCO Global Geopark property. Bjornsson H, Palsson F, Gudmundsson M T, 2000. Surface and bedrock topography of the Myrdalsjokull ice cap, Iceland: the Katla caldera, eruptions sites and routes of jokulhlaups. Jokull, 49: 29-46. Einarsson E H, Larsen G, Thorarinsson S, 1980. The Solheimar tephra layer and the Katla eruption of ca. 1357. Acta Nat Islandica, 3: 1-24. Jonsson J, 1987. The Eldgjar eruption and the Landbrot lava. Natturufraedingurinn, 57: 1-20 (in Icelandic with English summary). Lacasse C, Garbe-Schonberg C-D, 2001. Explosive silicic volcanism in Iceland and the Jan Mayen area during the last 6 Ma: sources and timing of major eruptions. J. Volcanol. Geotherm. Res., 107: 113-147. Lacasse C, Sigurdsson H, Carey S N, Johannesson H, Thomas L E, Rogers N W, 2007. Bimodal volcanism at the Katla subglacial caldera, Iceland: insight into the geochemistry and petrogenesis of rhyolitic magmas. Bull Volcanol, 69: 373-399. Lacasse C, Sigurdsson H, Johannesson H, Paterne M, Carey S, 1995. Source of Ash Zone 1 in the North Atlantic. Bull Volcanol, 57: 18-32. Larsen G, 2000. Holocene eruptions within the Katla volcanic system, south Iceland: characteristics and environmental impact. Jokull, 49: 1-28. Larsen G, 1979. The age of Eldgja lavas. Natturufraedingurinn, 49: 1-26 (in Icelandic with English summary). Larsen G, Newton A J, Dugmore A J, Vilmundardottir E G, 2001. Geochemistry, dispersal, volumes and chronology of Holocene silicic tephra layers from the Katla volcanic system, Iceland. J Quat Sci, 16: 119-132. Oladottir B A, Larsen G, Thordarson T, Sigmarsson O, 2005. The Katla volcano S-Iceland: Holocene tephra stratigraphy and eruption frequency. Jokull, 55: 53-74. Oladottir B A, Sigmarsson O, Larsen G, Thordarson T, 2008. Katla volcano, Iceland: magma composition, dynamics and eruption frequency as recorded by Holocene tephra layers. Bull Volcanol, 70: 475-493. Scharrer K, Spieler O, Mayer C, Munzer U, 2008. Imprints of sub-glacial volcanic activity on a glacier surface--SAR study of Katla volcano, Iceland. Bull Volcanol, 70: 495-506. Soosalu H, Jonsdottir K, Einarsson P, 2006. Seismicity crisis at the Katla volcano, Iceland--signs of a cryptodome?. J. Volcanol. Geotherm. Res., 153: 177-186. Thorarinsson S, 1975. Katla and the annal of Katla eruptions. Arbok Ferdafelags Islands 1975, p 125-149. Thordarson T, Miller D J, Larsen G, Self S, Sigurdsson H, 2001. New estimates of sulfur degassing and atmospheric mass-loading by the 934 AD Eldgja eruption. J. Volcanol. Geotherm. Res., 107: 33-54. There is data available for 132 Holocene eruptive periods. Remarks: Campaign GPS measurements on nunataks in the ice cap show outward displacement from the center of the caldera. There is no Emissions History data available for Katla. Katla volcano, located near the southern end of Iceland's eastern volcanic zone, is mostly hidden beneath the Myrdalsjökull icecap, which extends across the top of the photo. Valley glaciers descend from the summit icecap toward the coastal plain in this aerial view from the SSW. Explosive eruptions from Katla, among the largest tephra-producers in Iceland during historical time, have frequently been accompanied by damaging jökulhlaups, or glacier-outburst floods. Photo by Oddur Sigurdsson, 1985 (Icelandic National Energy Authority). The Global Volcanism Program has no maps available for Katla. There are no samples for Katla in the Smithsonian's NMNH Department of Mineral Sciences Rock and Ore collection. Catalogue of Icelandic Volcanoes (Link to Katla) The Catalogue of Icelandic Volcanoes is an interactive, web-based tool, containing information on volcanic systems that belong to the active volcanic zones of Iceland. It is a collaboration of the Icelandic Meteorological Office (the state volcano observatory), the Institute of Earth Sciences at the University of Iceland, and the Civil Protection Department of the National Commissioner of the Iceland Police, with contributions from a large number of specialists in Iceland and elsewhere. This official publication is intended to serve as an accurate and up-to-date source of information about active volcanoes in Iceland and their characteristics. The Catalogue forms a part of an integrated volcanic risk assessment project in Iceland GOSVÁ (commenced in 2012), as well as being part of the effort of FUTUREVOLC (2012-2016) on establishing an Icelandic volcano supersite. Large Eruptions of Katla Information about large Quaternary eruptions (VEI >= 4) is cataloged in the Large Magnitude Explosive Volcanic Eruptions (LaMEVE) database of the Volcano Global Risk Identification and Analysis Project (VOGRIPA).